What a washout of a summer. As I sit typing this blog the rain is lashing against the skylight – again! It’s not just the volume of water that this summer has thrown at us that has turned the British summer into a damp squib, but the wind ripping through plant and canvas. We were seriously concerned about my brother camping a couple of weeks ago in nearby Brixham, wondering if their new tent would take the pounding. 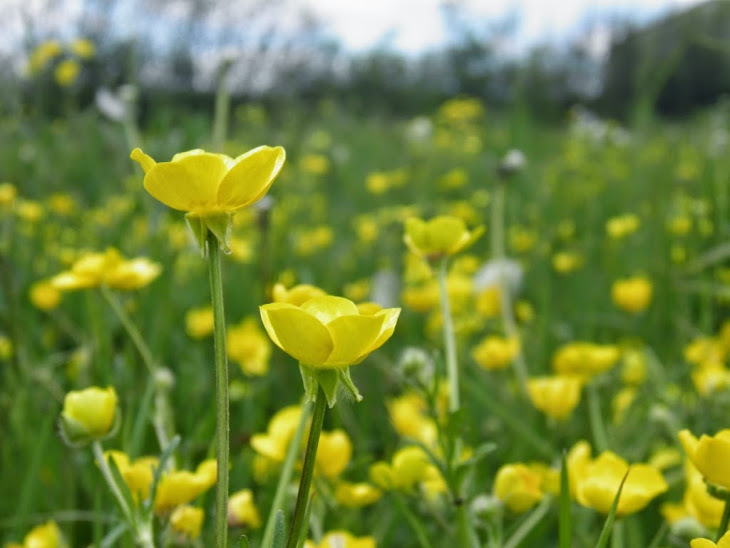 It’s easy for the human species to hide from the worst of the elements, but think of more delicate nature accustomed to light summer breezes and warm nectar. Honey bees have been so short of food that many beekeepers have had to take the unusual step of feeding them this summer with sugar solution. But what of other not so pampered invertebrates, such as butterflies and moths. No doubt we will feel the impact for years to come. There have been a few decent interludes and I have tried to get to the coast for the occasional walk. The resilience of nature to grab these weather opportunities is somewhat reassuring. 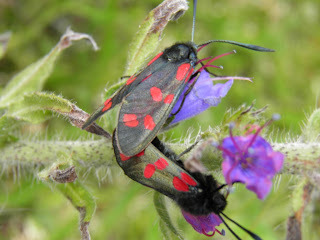 One species that has particularly drawn my attention are Six-spot Burnet moths (Zygaena filipendulae), whizzing from one purple flowered Knapweed to another. These day flying moths make the most of heat and sunshine. 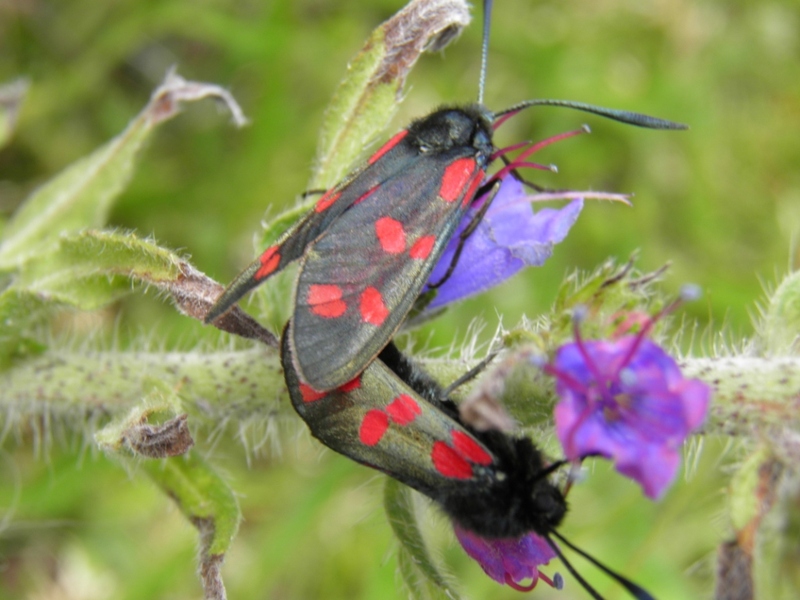 My friend Mary from Nottinghamshire spent years protecting and observing a ‘colony’ of Burnet moths living precariously on a busy verge, noting the emergence of the black & red adults on hot days. 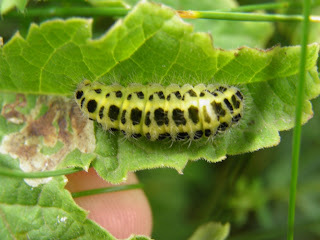 The caterpillars are equally colourful, yellow with broken black lines running the length of their body. However they are adept at protecting themselves by turning themselves into living cyanide pills for any unwary predators. Many plants produce cyanogenic glucosides to deter grazing animals, but these caterpillars are able to biosynthesise these chemicals for their own defense (Zagrobelny, et al., 2008). Perhaps more fascinating, when adults mate the males transfer a ‘nuptial gift’ of cyanogenic glucosides to virgin females, which it is suggested by researchers is then used for her own defence or to protect her eggs (Zagrobelny, et al., 2008) – indeed further experiments indicated that females can detect how much the males possess and reject those with low concentrations. I just hope that these stunning moths are as adept at coping with the vagaries of the increasingly volatile British summers as they are at developing chemical weapons.